People feel so strongly about audio reproduction that it often becomes akin to religion and politics and arguments ensue. 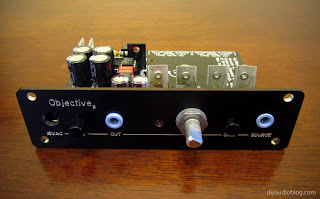 Some listeners feel that a perfectly flat response curve and fully diminished THD levels (total harmonic distortion) are the holy grail, while there are others that enjoy the warm distortion and harmonics achieved with old triode technology and a frequency response that tapers the upper and lower extremes. Both are right in their own way, the former looking for perfect accuracy, the latter looking for a relaxing listening experience, and there are probably many listeners that fall in between. 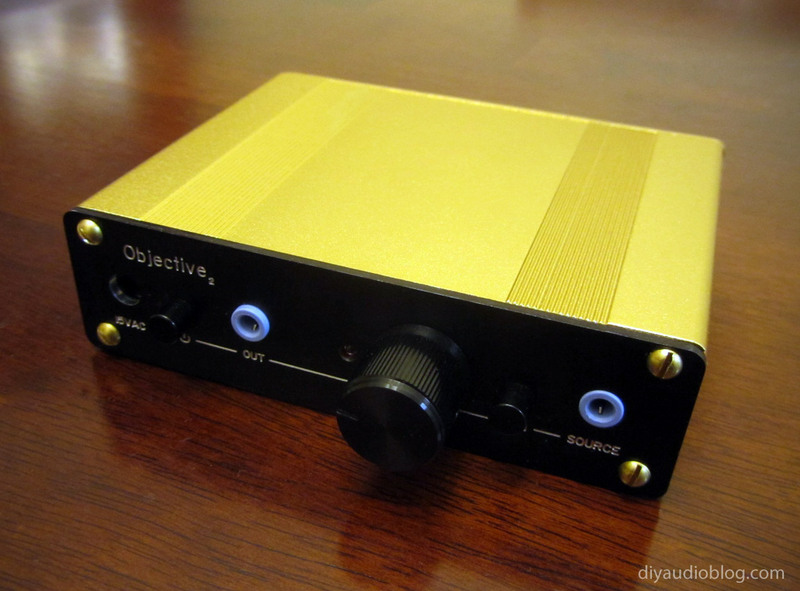 The Objective2 headphone amp falls into the first category, where good measurements are the paramount objective. NwAvGuy has gone to great lengths to provide what many headphone listeners have been pining for, a low-cost headphone amp that achieves great measurements in a vast number of categories. While I don't fall into the category of pursuing perfect measurements (just look at all the number of tubes used in the builds on this site), I highly respect the effort that went into this build and all subsequent documentation. Something that's quite impressive is that NwAvGuy does not make a penny from these designs. 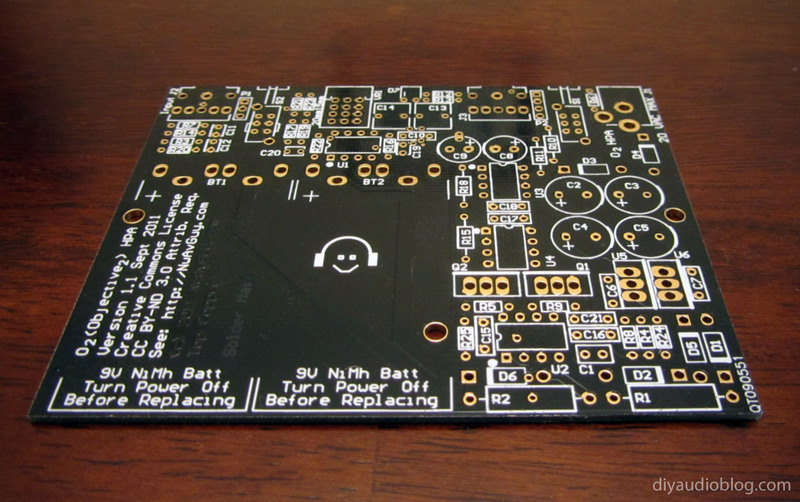 The PCB files are open source and circulated freely; users are encouraged to arrange group-buys on forums such as DIYAudio.com in order to procure the board and/or the front panel. Also, as of this writing, JDSLabs is offering both the O2 board and a unique front panel (to see the JDSLabs CMoyBB being built, please see my previous post). The total cost of the build is very reasonable and should fall under $100 including the case, custom front panel and wall-wart. 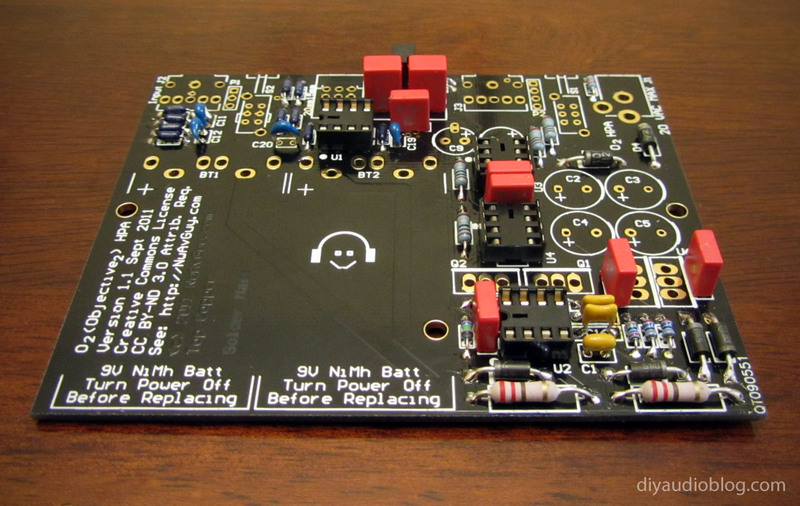 Add a couple hours of soldering time and you'll have yourself an amp. 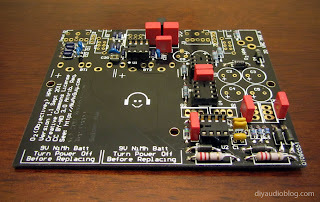 What's especially important with closely populated boards is starting with the small parts (resistors and diodes) and working your way up to the larger items such as capacitors and MOSFETs. If one doesn't follow this basic principal, it's much more difficult to fit your fingers into the small recesses between the larger items on the board. The battery clips may look crooked, but they were lined up carefully before soldering to ensure a perfect for for a 9V. This is something one doesn't want to try and adjust later as desoldering them can be difficult. 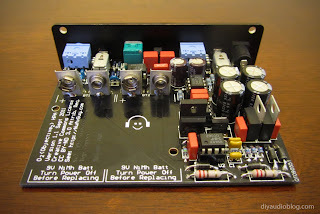 The faceplate shown was procured from a DIYAudio group buy. Many thanks to MrSlim and FlynHawaiian for their efforts. There are a number of testing procedures on NwAvGuy's site to ensure the amp is working properly before you plug a pair of headphones in to ensure that you don't inadvertently damage them with high DC output. A pair of Tenergy 9V rechargables were dropped in and secured with double sided tape and the unit was boxed up with the case specified by the bill of materials, a Box Enclosures B2-080. Gold was chosen as it's a bit more flashy than a plain black box. Screws were replaced with brass counterparts and the knob was a generic aluminum one from the parts bin, possibly made by Kilo. Once the amp had a few minutes to burn in, some cans were plugged in for a listen. 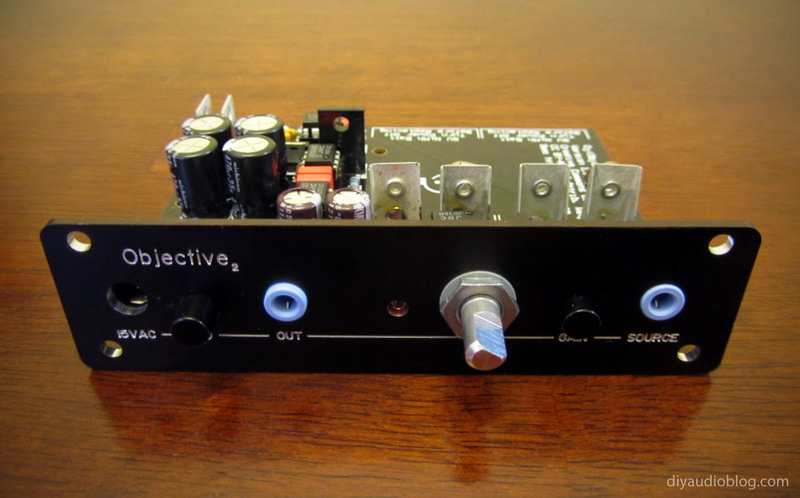 All online reviews of this amp were avoided so the initial listening could be done without any pre-conceived notions. The amp reminds me quite a bit of the headphone output of the Benchmark DAC from a HeadFi meet. It's very crisp, clear and has strong, effortless bass. The bass may even be a bit better than the Benchmark was, if memory serves correctly. Both amps are quite analytical; I wouldn't choose them for my own personal musical enjoyment as my ears are sensitive and need the treble and upper-midrange to be a bit rolled off or fatigue sets in too quickly. One can see this amp being highly recommended for audio mastering work as it should convey every detail possible to the editor. Immediately after building the amp, the input and output jacks were shorting with a variety of different plugs. It appears I received a bad batch as I didn't see any other documentation online regarding issues with the Kycon jacks. Rather than replace them with the identical items, Switchcraft jacks will be wired in as they are very trustworthy. The opamps will also be switched to the low-power versions made by Texas Instruments, which hopefully will be a little bit warmer.